When An external resistance R is connected with the battery of emf E and internal resistane r, what is the maximum power? distance b/w plate of capacitor C &q charge is increased to double . work done=?? a II plate capacitor has an electric field of 105 V/m b/w d plates . if charge on capacitor plate is 1uC d force on each capacitor is?? A charge of +2.0 x 10^-8 C is placed on the positive plate and a charge of -1.0 x 10^-8 C on the negative plate of a parallel plate capacitor of capacitance 1.2 x 10^-3 uF. Calculate the potential difference developed between the plates. Please add explanation! One end of a 10cm long silk thread is fixed to a large vertical surface of a charged nonconducting plate having a mass 10g and a charge of 4*10^-6 c . In equlibrium the thread makes an angle of 60 deg. With he vertical.find the surface charge density on plate. solve this eq. for σ. Remember that length of the thread is not applicable in the question. after substituting the values we get the answer as give above. there is slight mistake in last line of previous question.it was find the work done on the system in the process of inserting the slab. a parallel plate capacitor of plate A and plate seperation d is charged to a potential dif. V and then the battery is disconnected .a slab of dielectric constant K is then inserted between the plates of capacitor so as tofill the space bet. The plates .find the work done in this process. WORK DONE = ZERO BECAUSE U initial & final is same that is q2/ 2KC . WHEN THE SLAB IS REMOVED THEN ALSO THE SAME U. THUS W.d BY SYSTEM IS ZERO. 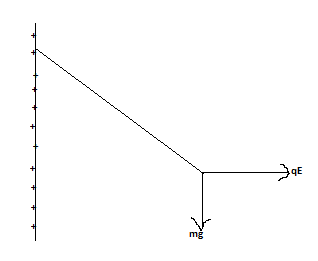 since net potential = 0, answer will be 0 for the given diagram. By interchanging the poles of any one battery this question will become meannigfull so change it and apply Kirchhoff law.